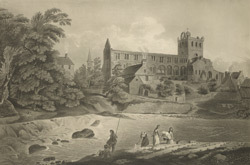 View of Jedburgh Abbey on the banks of the Jed Water, in Scotland. The Abbey was built at the edge of the Scottish King David’s frontier with England, on the site of an earlier church, built in the 9th century by Bishop Ecgred of Lindisfarne. The Abbey was started in the early 12th century but took over one hundred years to build and was eventually completed in 1285. The church is built in an elaborate style with elements of both Romanesque and Gothic style.